What Makes Amish Furniture So Unique? Comments Off on What Makes Amish Furniture So Unique? What makes Amish furniture so unique? Step into an Amish furniture store, such as Brandenberry Amish Furniture in Shipshewana, Indiana. Or peruse Brandenberry’s online catalog. And you’ll be amazed by the most beautiful collections of furniture imaginable. With a dazzling display of fine cabinetmaking features like entertainment centers with a bridge joining two cabinets. Or cabinet doors with raised panels or mullioned glass. Plus the finest cabinetwork perfectly complemented by fine hardware. So here are some reasons Amish furniture is so unique. Skilled Indiana Amish cabinetmakers painstakingly handcraft each item of furniture sold by Brandenberry. And the Amish men use solid Midwestern hardwoods like oak, cherry, maple and hickory. You won’t find bargain substitutes like wood or paper veneers fused to particle board or cardboard. And instead of nails or brads, the Amish artisans use screws and glue. Plus dovetail and mortis and tenon joints. In fact, the Amish builders go as far as to use solid wood sheets (about ½-inch thick) for the back or flooring of furniture. 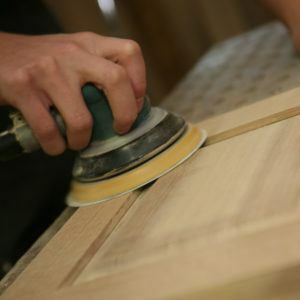 Many traditional furniture builders use pressed cardboard covered with faux wood veneer. The result? Amish furniture is incredibly durable. So much so that with proper care, the furniture should last for generations to come. Even becoming a family heirloom. Artisans apply time-honored cabinetmaking skills to make Amish furniture from Brandenberry unique. In fact, the Amish craftsmen draw from cabinetmaking skills handed down from their ancestors. And they integrate these skills with the latest tools and techniques. Even a glance at a piece of furniture from Brandenberry will reveal some awesome examples of fine cabinetry. Some pieces come with fluted columns, ebony inlays and decorative corbels. You’ll also find dovetail and mortis and tenon joints. Plus ornate crown moldings as well as dentil or rope trim. You might also notice fluted columns and mullion doors in the middle. And flared or bun feet down below. So what is the likelihood of finding furniture with such intricate cabinetwork at a traditional furniture store, department store or big box store? You guessed it. Amish furniture from Brandenberry includes a full range of styles and designs. From Classic to Modern, Mission and Shaker to Avant-Garde. Also, Amish craftsmen create furniture for every room in your house. They even make furniture for the home office. In fact, the Brandenberry online collections include close to 5,000 products. So what makes Amish furniture so unique? Visit Brandenberry Amish Furniture and find out for yourself.